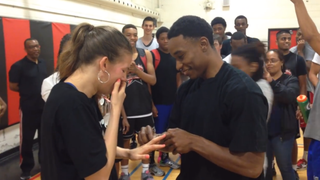 Canadian basketball player Alex Johnson proposes to his girlfriend, former University of North Carolina at Greensboro guard Brey Dorsett, in their own version of Love & Basketball. A former guard at North Carolina State starred this week in his own version of the classic romantic movie Love & Basketball, according to Fox 8 TV. Alex “Superman” Johnson, a player for the Saint John Mill Rats of the National Basketball League of Canada, on Thursday was playing one-on-one with his girlfriend, Brey Dorsett, a former University of North Carolina at Greensboro basketball star, when he fell to the floor and faked an injury, the report says.